National Horseplayers Championship (NHC) Tour “First Half” leader Mike Ferrozzo, of Eagan, Minn., hit the board in just enough of the right spots down the stretch, tallying 18,825 points overall and holding off late charges from several veteran handicappers to win the 2017 NHC Tour, which ended Saturday. Ferrozzo earned $100,000, a trophy, and the chance to play for a $2 million bonus at NHC 19, Feb. 9-11, at Treasure Island Las Vegas. Christopher Dewey of Troy, N.Y., finished second with 18,721 points, good for a $50,000 payday, followed by Roger Cettina, the two-time NHC runner-up from Rumson, N.J., with 18,021 points, worth $25,000. The top 20 finishers on The LUXAIR JETS Leaderboard shared $285,000 of prize money. An additional $100,000 in NHC Tour prize money went to the top five “First Half” and “Second Half” finishers on separate six-month leaderboards, each of whom receive a $10,000 entry to the 2018 Breeders’ Cup Betting Challenge (BCBC). Ferrozzo’s “First Half” score plus his overall win bring his 2017 NHC Tour earnings to $110,000. Overall NHC Tour standings are determined by totaling a player’s top six scores from eligible qualifying contests, which must include at least one live, on-site event. Any of the top 150 finishers on the NHC Tour not previously qualified – which applied to 49 players – earned automatic berths to next month’s NTRA National Horseplayers Championship (NHC) Presented by Racetrack Television Network, STATS Race Lens™ and Treasure Island Las Vegas. The top 40 NHC Tour finishers will compete for a $25,000 Tour Bonus, which goes to the individual within that group with the highest finish at NHC 19. 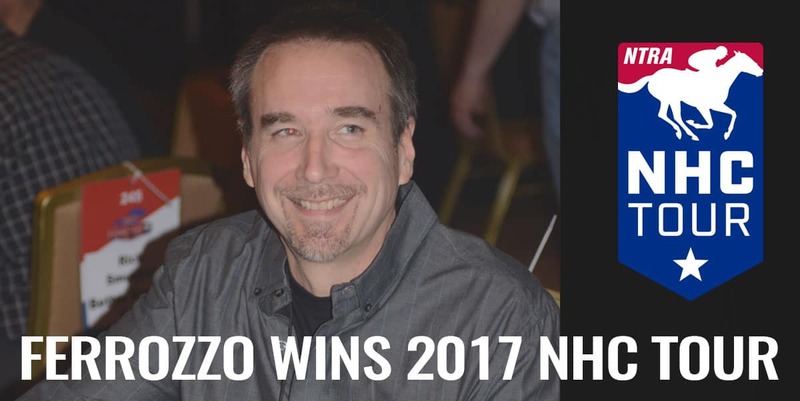 Ferrozzo’s six scoring contests for NHC Tour purposes included a March win at Hawthorne worth 3,508 points; two wins on consecutive weekends in July on HorsePlayers.com (3,750 points and 2,556 points); a third in October on HorseTourneys.com (2,617 points); a second on HorsePlayers.com on Breeders’ Cup Friday (2,451 points); and a second at Hawthorne on Dec. 29 (2,443 points). After winning the First Half, Ferrozzo slipped down the leaderboard and felt he had lost too much ground to compete for the overall championship. He kept plugging away, though, hoping to protect a top 20 finish and still get a check. “I had a few decent finishes, seconds and thirds, and passed a few people,” Ferrozzo said. “Then I tried to pass a few more, just making baby steps, and then I realized, holy smokes, I’m in third place. I’ve got to go for this! I may never be here again! Ferrozzo, 59 (b. April 13, 1958), an IT projects manager specializing in healthcare, was a Final Table participant at NHC 16 in 2015. He is already deep into his NHC preparations, studying replays and making notes on trips and biases. The goal is to arrive in Las Vegas with a list of horses Ferrozzo expects to perform better next time out, and hope that several of them show up in the entries the second weekend of February. With a $2 million bonus available exclusively to him should he win NHC 19, on top of the $800,000 first-place prize, Ferrozzo is willing to put in as much homework as he can find time for. “It’s a once in a lifetime chance,” he said. The NHC Tour top five was rounded out by David McCarty of Del Mar, Calif., in fourth with 17,375 points, good for $17,5000 in prize money, just ahead of 2014 NHC Tour champ Eric Moomey with 17,321 points, worth $10,000. McCarty and Moomey also were among the “First Half” top five. Full standings for the NHC Tour and bonus divisions can be accessed online via the NTRA website at http://ntra.kinsta.com/nhc/leaders. The 2018 NHC Tour kicks off Feb. 10, the Saturday of NHC 18, with an online contest, the details of which will be announced in coming weeks. NHC Tour membership is $50-$95 and participants can sign up online at www.ntra.com/membership. Terry Cook of Towson, Md., who won two Saratoga Challenge contests on consecutive days at the Spa in August and the Aqueduct Challenge in November, rode his New York Racing Association dominance to land atop the NHC Tour “Second Half” leaderboard, based on results posted after August 1, with 13,014 points. All of the top five “Second Half” finishers earned $10,000 BCBC berths. The others were Nick Fazzolari (11,903 points), Philip Lam (11,283), Jim Sebes (11,193), and Edward Osterhaut (11,155). Charles Myers (21,971 points) of Redford, Mich., earned a $5,000 “Rookie” bonus as the leading player that signed up for the NHC Tour for the first time in 2017. The rest of that $15,000 prize pool went to Scott Boudreaux (16,076 points; $4,000 bonus), Carol Johnson (13,054; $3,000), Gary Fenton (11,968; $2,000), and Karl Barth (9,905; $1,000). The NHC Tour is a yearlong bonus series offering additional prize money and qualifying berths to the DRF/NTRA National Handicapping Championship. Tour members receive NHC Tour points for top finishes in NHC qualifying events held during the year. In addition to potential prize money and berths in the NHC, benefits for NHC Tour members include automatic enrollment in the Horseplayers’ Coalition. The Coalition seeks legislative and regulatory solutions to tax and business issues that impact pari-mutuel racetracks and their customers and provides grass roots support for the NTRA’s lobbying efforts on Capitol Hill. Tour members also are automatically eligible to participate in NTRA Advantage, offering preferred pricing on products and services from leading suppliers, including John Deere, Nationwide, UPS, and OfficeMax/Office Depot. In its 19th year, the NTRA National Horseplayers Championship (formerly known as the NTRA National Handicapping Championship) is presented by Racetrack Television Network, STATS Race Lens and Treasure Island Las Vegas. Equibase is the official data provider of the NHC and NHC Tour. The NHC is world’s richest and most prestigious handicapping tournament of the year for horseplayers and is the culmination of a year-long series of NTRA-sanctioned local tournaments conducted by racetracks, casino race books, off-track betting facilities, and horse racing and handicapping websites, each of which sends its top qualifiers to the national finals. Each year, the NHC winner joins other human and equine champions as an honoree at the Eclipse Awards. The most recent NHC offered record prize money and awards totaling more than $2.9 million. NHC 19 will be held February 9-11, 2018, at Treasure Island Las Vegas.